It's the age-old problem with Windows and something I get more email about than anything else. All the time people are emailing me saying that Windows has failed and they're at risk of losing all their files and data. It is really appalling to me that this is still happening. After all, the focus of your PC has for too long appeared to be Windows itself, but it just isn't. The main focus of your PC is your files and documents surely! Windows is designed to be installed on single disk systems, it's always been that way. You install Windows onto your C: drive and a folder will be created for your files. Your 'personal' folders will automatically be stored there (Documents, Pictures, Music and the like) and any new files you copy over to your PC will be put there. The problem is that as and when something goes wrong with Windows, which is inevitable eventually, you risk losing all your files and data if you don't keep regular backups. I get emails from people all the time asking for help with this and how they can get their data back, or at least not lose it to begin with. Now you're probably saying at this point that people should always keep regular backups of their data, and you won't get any argument from me. It's not always that simple though, especially if you have a lot of critical files that change regularly. There are also personal, financial or other circumstances that mean people won't have regular backups or backups at all. Let's not forget that while Windows 7 might nag you to back up your files, millions of people are still using Windows XP and Vista which don't, and most of those people and the people using Windows 7 aren't technically minded and may not even know what this means. This should therefore mean that Microsoft need to guide people and help them to keep their files and data safe. They've made precious little progress here in the last decade though, having only added the ability with Windows Vista to cut and paste your 'user folders' to another location easily. There's no indication you can actually do this however, no help on the matter and no nagging from the Windows 7 Action Centre to remind you to do so. With Windows 8 I'm beginning to feel the gloom setting in that nothing more will change. What we desperately need is one of the following two scenarios but I'm doubtful somehow that either will happen. Scenario 1 : Separation at Installation- It wouldn't be too difficult for the Windows installer to ask you, when times comes to install Windows. "Do you want to install Windows and your user files onto this 1Tb hard disk in your computer or would you like to separate them", before going onto explain why seperating them is a good idea. The installer could then do one of the following, ask what you want to use your computer for (light use, music and photos, work, gaming) and create two partitions of recommended size. Alternatively it could split the hard drive by proportion, 50/50, 30/70 and so on or finally it could ask you what size you want the two partitions to be and make recommendations to you. All of these options would be simple enough for people to understand and it would be easy and simple for the Windows installer, on a clean install anyway, to do this for you. Scenario 2 : Separation after Installation - Windows already has the ability to grow and shrink partitions. Why doesn't it suggest to you after you install it through an Action Centre message that "You can greatly decrease the chances of losing files and data by moving them away from Windows, would you like to do this now?" Here there would again be several options. It could shrink the current Windows Partition and then move the user folders for you. Alternatively, if you have a separate hard disk it could simply move the user files there. It's easy for Windows to determine what is internal and external storage so this wouldn't be at all difficult. This would also mean that if you're reinstalling and have already moved the folders in the past, the pointers will be updated in Windows to where you've put them. Are either of these scenarios likely to happen though? 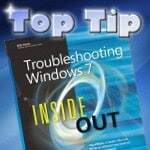 Moving your files and folders away from your Windows installation is something I feel very strongly about and it's something I write about at some length in my book Troubleshooting Windows 7 Inside Out. There are ways to make sure you don't ever lose your files and data (unsurprisingly I write about those as well, and will write additional articles on the subject here in the coming weeks) but in the mean time keep the emails coming to mike@MVPs.org. I am not only supporting to move away your data files away from your system (o.s.) disk but also that you use (a small drive) your installation SSD or hard disk, only for your o.s. and program. Next to that I also advantaging that you use no partion on the installation o.s. – and program SSD/ harddrive. The best way to handle your data is to store it to one other drive not directly related to your o.s. SSD/hard drive. This is something for Microsoft to consider in the installation process. @oh hai – what a useless solution you offer, and totally ridiculous. shows your lack of real-world experience. this is one RSS less I will now follow. Actually your incoherent reply is pointless. Your absence will raise the discussion level. @Robert Palmer – actually, your comment is not welcome and YOUR absence is welcome. at least the other person was not trolling and made some valid points, unlike you. if you don’t like it, be constructive or SHUT UP. You define being a troll. I’m glad you are so upset. I’ve thought this since Windows 3.1. A decade and a half later, things haven’t improved – and for once, Linux isn’t much better – lose your OS partition and you probably lose everything. For many years – like most folks here I suspect – I’ve put my documents onto another partition. But it’s a disgrace that this isn’t the Windows default by now (though I notice some PC manufacturers increasingly set up machines this way). Also, I’ve always believed that – while the main disk is always better partitioned into two – a second internal disk is almost mandatory. Otherwise, lose the disk – lose the lot. Every PC I’ve had for the last 15 years has had two internal HDs – and latterly a couple of external USB HDs too. On my Docs partition I now also keep a Portable folder – applications that can withstand the total loss and re-installation of Windows, Not everything works this way, but (for example) use of Portable Thunderbird has meant I haven’t lost a single email in a very long time (again – touch wood if I’m tempting fate!). That entire folder too is constantly backed up to the second HD. A workable solution – for me at least. But – on our new, gleaming, bling, 21st-century computers we should NOT have to generate workarounds for something as important as data !!!! Seperation should be done for My Documents folder. A lot of applications use this folder to store data. There should be a sepearate folder for users documents vs application data. A lot of games save files to My Documents folder. This IMO creates a big mess. When Microsoft renamed My Documents to Documents they should have created a new folder not a link to My Documents where a lot of apps store data. Not really. Most distros will automatically partition the drive for a separate /root, /home and /swap layout if left to their own devices. And they make it pretty easy to partition for yourself if you need more partitions. If you lose the disk, you lose everything, but not if a partition gets damaged. If the partition TABLE gets damaged, no OS can help you. At least in Linux there are tools available to fix the problem from the install CD – something I see Windows 7 has tried to incorporate after Linux led the way. It’s always amusing to read stories of how some Linux guy fixed their friend’s Windows system using a Linux Live CD. Of course there are equivalents on the Windows side like the Ultimate Boot CD For Windows – but only from third parties. I have three drives in my openSUSE 11.4 system called LinuxData1, LinuxData2 and LinuxData3. Two are 500GB drives, and one is 1TB. I backup to a 2TB external WD MyBook using FWBackups. I almost never put anything on my /home drive except the settings folders for things like Firefox. I usually back those up to another folder on one of the data drives (as well as backing up /home to the external drive). When I ran Windows XP (dual booting with previous Linux distros), I did pretty much the same thing. All data went on a separate partition and/or separate drive. There are MVPs who argue that a Windows repair install or even a clean install that is not told to format the partition first will hardly ever damage existing data, but frankly I don’t believe them. There’s just too many “random behaviors” on the part of any version of Windows to trust it. A separate drive is best because a partition table failure can total everything – and Windows is VERY good at screwing up its own partition table. I recently did a clean install on a client’s Windows 7 machine (brand new) – and it screwed up its BCD within 24 hours. Worse, it’s REALLY hard to get to the command line on Win7 to run bcdedit or other command line tools IF the “System Repair” function either can’t locate the existing OS or simply fails. And some of the available tools don’t work well in Win7 PE environments. Major PITA! It’s almost as if Microsoft decided with Win7 to PREVENT users from being able to do anything to repair a system except running a clean install. You can’t even do a Repair Install any more from a WinPE environment – you have to have a running Win7 to do a repair install! Insane! The excuse is that doing a repair install in WinXP caused the OS to be “unstable”! And yet this was a long recommended fix by both Microsoft and external techs for otherwise insoluble problems. There are still some Win7 PE environments being created over at reboot.pro that can be made to work with some repair tools. But Microsoft’s total lack of interest in these sorts of things – the Windows System Recovery Disk isn’t even close – demonstrates Gate’s and Ballmer’s total lack of interest in supporting their customers past the sale. As a developer, it’s certainly true that I spend 75% of my time working with my own files and documents. But for my non-work activities, it’s more like 25%. The majority of the rest of my time is spent interacting with applications. Browsing the web. Playing games. Fiddling with Google Earth. Talking to friends on Skype. None of these things are really document centered — if my machine goes down, do I really care that I have browser history accessible on another partition? My bookmarks and my addressbook are synced to the cloud anyway. If my machine goes down, the most laborious part of my recovery time is spent rebuilding the new machine with the applications I like. And Windows does little to help you out there, because an installed application is spread out over the whole goddamn system. Installer folder. Registry. DLLs. Managed Framework. Extra assemblies in the assembly cache. And is the main stuff in a Program Files folder, a Program Files (X86) folder, or a subfolder of my profile? Who knows? Ross Presser makes a telling point about Windows infuriatingly spread out installation procedures for applications – it begs a separate article on this and potential workarounds. I still agree with the article’s premise, though – “losing” OS and apps and subsequent re-installation is frustrating and very time-consuming; losing photos of 5 years of recorded family life (for example) is heartbreaking. I’ve migrated many apps/functions to Liberkey, which can be installed on a separate drive or partition and be set to start up with Windows, with an icon in the notification area. Liberkey is in my Dropbox folder, so re-installation is a breeze(comparatively). I do wish Windows wouldn’t make it so easy for programs to use the “My Documents” folder and the standard sub-folders (Music, etc.) as default locations (without the user having a choice). I would like for only the items that I choose to put there to appear, keeping things tidy and easy to access. Mapping “My Documents” to another drive/partition isn’t an elegant option, when your carefully filed items are cluttered amongst various log files, automatically created folders, etc.